I have a Ex+ 45 like this what is it worth? I have a copy where everything matches up except mine definitely has 1-2 hand etched at the end of the Side A run-out and mine doesn't have the sample copy sticker... anyone have any insight on this? 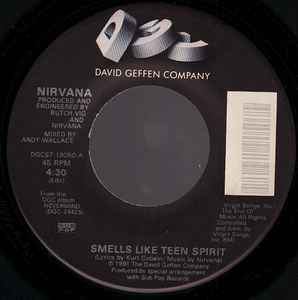 "Smells Like Teen Spirit" on this release is the full-length album version, not the "edit".